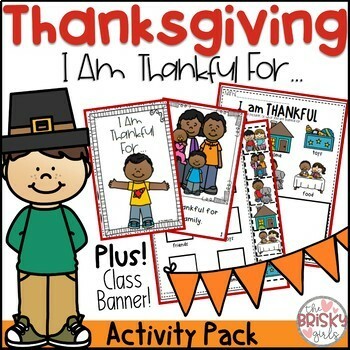 Thanksgiving Activity Pack and Bulletin Board Display! Looking for an engaging guided reading lesson for the Thanksgiving holiday? 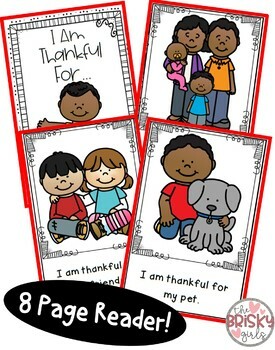 This pack includes a 8 page predictable text student reader titled "I Am Thankful For" which focuses on being thankful for the good things in life. There are 2 comprehension activity pages which focus on text-to-self and word/picture matching. Also includes a Pennant Banner Template! 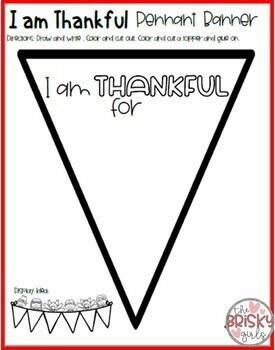 Students draw/write what they are thankful for on the flag, attach a Thanksgiving Topper (6 included), and hang together as a class banner. All pages come in both COLOR and B/W!